It is my pleasure to inform you that our 2019 Annual Meeting of Shareholders will be conducted online on Thursday, May 9, 2019, starting at 8:30 a.m. EDT. The virtual nature of the meeting will continue to enable increased shareholder accessibility, while improving meeting efficiency and reducing costs. Shareholders will be able to listen, vote, and submit questions from their home or any remote location with Internet connectivity. Information on how to participate in this year's virtual meeting can be found on page 87. In 2018 we took aggressive steps to improve the efficiency and focus of our traditional automotive business. Equally important we accelerated our efforts to be a leader in the mobility services of tomorrow. While 2018 was challenging, we still achieved our ninth consecutive year of solid earnings and positive operating-related cash flow. These profits enabled us to distribute $3.1 billion to our shareholders last year, and $18.4 billion since 2012. As we strengthen our product portfolio we are committed to reducing vehicle emissions by delivering CO2 reductions consistent with the Paris Climate Accord. We are investing $11 billion in electrification to deliver 40 new hybrid and electric vehicles globally by 2022. Looking farther into the future, the actions we are taking to improve efficiencies are freeing up capital to invest in emerging businesses. We expect to invest $4 billion in our autonomous vehicle efforts through 2023, including our $1 billion investment in Argo AI. As we move into the 21st century we are reimagining what mobility will look like beyond the privately owned internal combustion engine automobile. That means not just smart cars, but also smart roads, smart parking, and smart public transit systems, all talking to one another. It means rethinking cities so that even as millions more people move to cities the air is cleaner, the streets less congested and everyone has access to efficient, affordable and sustainable mobility. Since the days of the Model T people have trusted us to get them where they want to go, do what is right for them and make their lives better. Whatever form mobility takes in the future, our Board of Directors, leadership team and extended family of employees are determined to continue earning your trust as we strive to become the world's most trusted company designing smart vehicles for a smart world. This year's virtual annual meeting will begin promptly at 8:30 a.m., Eastern Daylight Savings Time. If you plan to participate in the virtual meeting, please see the instructions on page 87 of the Proxy Statement. Shareholders will be able to listen, vote, and submit questions from their home or from any remote location that has Internet connectivity. There will be no physical location for shareholders to attend. Shareholders may only participate online by logging in at www.virtualshareholdermeeting.com/FORD2019. The election of the 13 director nominees named in the Proxy Statement. The ratification of the selection of PricewaterhouseCoopers LLP as Ford's independent registered public accounting firm for 2019. Approval of the Tax Benefit Preservation Plan. Consideration of the three shareholder proposals set forth in the Proxy Statement. If you were a shareholder at the close of business on March 13, 2019, you are eligible to vote at this year's annual meeting. Please see Other Items and the Questions and Answers section beginning on page 83 for important information about the proxy materials, voting, the virtual annual meeting, Company documents, communications, and the deadline to submit shareholder proposals for the 2020 Annual Meeting of Shareholders. Shareholders are being notified of the Proxy Statement and the form of proxy beginning March 29, 2019. We urge each shareholder to promptly sign and return the enclosed proxy card or to use telephone or online voting. See our Questions and Answers beginning on page 84 for information about the virtual meeting and voting by telephone or online and how to revoke a proxy. This summary highlights information contained in this Proxy Statement. It does not contain all of the information you should consider. You should read the entire Proxy Statement carefully before voting. Please see the Questions and Answers section beginning on page 84 for important information about proxy materials, voting, the virtual annual meeting, Company documents, and communications. The Board of Directors is soliciting proxies to be used at the annual meeting of shareholders. This Proxy Statement and the enclosed proxy are being made available to shareholders beginning March 29, 2019. We will hold a virtual annual meeting of shareholders. Shareholders may participate online by logging onto www.virtualshareholdermeeting.com/FORD2019. There will not be a physical meeting location. See pages 27, 74, and 75 of Ford's 2018 Form 10-K for definitions and reconciliations to GAAP. * See pages 27 and 74 of Ford's 2018 Form 10-K for definitions and reconciliations to GAAP. The information in this Performance Section shows we continue to deliver positive results over a sustained time period. In order to create greater value for our stakeholders, it is important that we attack costs as well as redesign our business operations to take advantage of future growth opportunities. The graphics below show some of our achievements in our areas of strength and the strategic choices we are making to drive future growth. A Performance Unit is an award of the right to earn up to a certain number of shares of common stock, Restricted Stock Units, or cash, or a combination of cash and shares of common stock or Restricted Stock Units, based on performance against specified goals established by the Compensation Committee under the Long-Term Incentive Plan. A Time-Based Restricted Stock Unit ("Time-Based Unit") represents the right to receive a share of common stock, or cash equivalent to the value of a share of common stock, when the restriction period ends, under the Long-Term Incentive Plan, as determined by the Compensation Committee. We regularly meet with investors and consider any concerns shared with us. For instance, in 2015 we made significant changes to our Performance Unit program that addressed investor comments. Ford's senior leadership team and Investor Relations met with fixed income and equity holders, as well as potential holders, at eighteen conferences and eighteen roadshows. We hosted quarterly earnings calls, which were webcast, and also engaged with the capital markets via phone calls, emails, in-house meetings, and other industry events. We also held an autonomous vehicle event in Miami attended by key stakeholders. As an indication of our commitment to fostering strong communication ties with our stakeholders, we met with shareholders representing 57% of our institutional equity investor base and fixed income investors holding 25% of our unsecured debt outstanding. Topics discussed included: long term strategy, financial and operating performance, risk management, and environmental, social and governance practices. We found these meetings to be informative, and we continue to incorporate many stakeholder suggestions into our Proxy Statement and communications strategy. Independent Board. 77% of the Director Nominees are independent. Committee Charters. Each standing committee operates under a written charter that has been approved by the Board and is reviewed annually. Mandatory Deferral of Compensation for Directors. In 2018, approximately 68% of annual director fees were mandatorily deferred into Ford restricted stock units, which strongly links the interests of the Board with those of shareholders. The Nominating and Governance Committee recommends the nominees for all directorships. The Committee also reviews and makes recommendations to the Board on matters such as the size and composition of the Board in order to ensure the Board has the requisite expertise and its membership consists of persons with sufficiently diverse and independent backgrounds. Between annual shareholder meetings, the Board may elect directors to the Board to serve until the next annual meeting. In 2018 we implemented a more robust peer and Board and Committee self-assessment process. The Lead Independent Director communicates with each director concerning their performance and that of their peers and shares any significant concerns. We also instituted an evaluation process whereby every five years each director's skills and qualifications are analyzed as to whether such skills and qualifications remain relevant in light of changing business conditions. recommended that the size of the Board be reduced to 13 at this time. The Board believes that it has an appropriate mix of short- and medium-tenured directors as well as long-tenured directors that provide a balance that enables the Board to benefit from fresh insights and historical perspectives during its deliberations. In addition, having two members of the Ford family, William Clay Ford, Jr. and Edsel B. Ford II, who are first cousins, bring a unique historical and long-term perspective to Board deliberations. In addition, the Board has managed succession planning effectively with strategic waivers of the mandatory retirement age where appropriate to maintain certain expertise while new directors supplement the Board structure. The Board proposes to you a slate of nominees for election to the Board at the annual meeting. You may propose nominees (other than self-nominations) for consideration by the Committee by submitting the names, qualifications, and other supporting information to: Secretary, Ford Motor Company, One American Road, Dearborn, MI 48126. Properly submitted recommendations must be received no later than November 30, 2019, to be considered by the Committee for inclusion in the following year's nominations for election to the Board. Your properly submitted candidates are evaluated in the same manner as those candidates recommended by other sources. All candidates are considered in light of the needs of the Board with due consideration given to the qualifications described on p. 24 under Election of Directors. Only independent directors serve on the Audit, Compensation, and Nominating and Governance Committees, in accordance with the independence standards of the New York Stock Exchange LLC ("NYSE") Listed Company and Securities and Exchange Commission ("SEC") rules and the Company's Corporate Governance Principles. Under these standards members of the Audit Committee also satisfy the heightened SEC independence standards for audit committees and the members of the Compensation Committee satisfy the additional NYSE independence standards for compensation committees. Each member of the Audit Committee also meets the financial literacy requirements of the NYSE Listed Company rules. The Board, and each committee of the Board, has the authority to engage independent consultants and advisors at the Company's expense. accounting firm) all relationships between the independent registered public accounting firm and the Company. Consults with the independent registered public accounting firm, reviews and approves the scope of their audit, and reviews their independence and performance. Also, annually approves categories of services to be performed by the independent registered public accounting firm and reviews and, if appropriate, approves in advance any new proposed engagement greater than $250,000. Reviews activities, organization structure, and qualifications of the General Auditor's Office, and participates in the appointment, dismissal, evaluation, and determination of the compensation of the General Auditor. 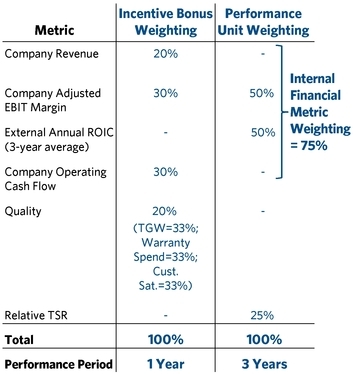 CEO, and other executive officers' compensation, including annual performance objectives. Establishes criteria for selecting new directors and the evaluation of the Board, including whether current members and candidates possess skills and qualifications that support the Company's strategy. Considers shareholder suggestions for director nominees (other than self-nominations). See Composition of Board of Directors/Nominees on p. 11. The oversight responsibility of the Board and its Committees is supported by Company management and the risk management processes that are currently in place. Ford has extensive and effective risk management processes, relating specifically to compliance, reporting, operating, and strategic risks. Compliance Risk encompasses matters such as legal and regulatory compliance (e.g., Foreign Corrupt Practices Act, environmental, OSHA/safety, etc.). Reporting Risk covers Sarbanes-Oxley compliance, disclosure controls and procedures, and accounting compliance. Operating Risk addresses the myriad of matters related to the operation of a complex company such as Ford (e.g., quality, supply chain, sales and service, financing and liquidity, product development and engineering, labor, etc.). Strategic Risk encompasses somewhat broader and longer-term matters, including, but not limited to, technology development, sustainability, capital allocation, management development, retention and compensation, competitive developments, and geopolitical developments. We believe that key success factors in the risk management at Ford include a strong risk analysis tone set by the Board and senior management, which is shown through their commitment to effective top-down and bottom-up communication (including communication between management and the Board and Committees), and active cross-functional participation among the Business Units and Functional Skill Teams. More specifically, we have institutionalized the Creating Value Roadmap Process, which includes a Business Plan Review and Special Attention Review process where, on a regular basis, the senior leadership of the Company reviews the status of the business, the risks and opportunities presented to the business (in the areas of compliance, reporting, operating, and strategic risks), and, utilizing the principles of design thinking and critical thinking, develops specific plans to address those risks and opportunities. procedures that have been adopted to support the Creating Value Roadmap Process. The Board of Directors recognizes the Creating Value Roadmap Process as the Company's primary risk management tool, and the Audit Committee and the Board review annually the Creating Value Roadmap Process, the Company's adherence to it, and its effectiveness. We continually review our enterprise risk management processes and procedures with the goal of improving our assessment of, and response to, risks and opportunities. In 2018, we conducted an annual assessment of our compensation policies and practices, including our executive compensation programs, to evaluate the potential risks associated with these policies and practices. We reviewed and discussed the findings of the assessment with the Compensation Committee and concluded that our compensation programs are designed with an appropriate balance of risk and reward and do not encourage excessive or unnecessary risk-taking behavior. As a result, we do not believe that risks relating to our compensation policies and practices for our employees are reasonably likely to have a material adverse effect on the Company. stock ownership goals that align the interests of executive officers with those of our shareholders  this discourages executive officers from focusing on short-term results without regard to longer-term consequences. of our executive compensation programs with the goal of appropriately balancing short-term incentives and long-term performance. The Committee makes decisions regarding the compensation of our officers that are Vice Presidents and above, including the Named Executives. The Committee has delegated authority, within prescribed share limits, to a Long-Term Incentive Compensation Award Committee (comprised of William Clay Ford, Jr., and James P. Hackett) to approve grants of options, Performance Units, Time-Based Units, and other stock-based awards, and to the Annual Incentive Compensation Award Committee (also comprised of Messrs. Ford and Hackett) to determine bonuses for other employees. The Board of Directors makes decisions relating to non-employee director compensation. Any proposed changes are reviewed in advance and recommended to the Board by the Nominating and Governance Committee (see Director Compensation in 2018 on pp. 32-33). The Compensation Committee considers recommendations from Mr. Ford, Mr. Hackett, and the Chief Human Resources Officer in developing compensation plans and evaluating performance of other executive officers. The Committee's consultant also provides advice and analysis on the structure and level of executive compensation. Final decisions on any major element of compensation, however, as well as total compensation for executive officers, are made by the Compensation Committee. compensation consulting firm, to advise the Committee on executive compensation and benefits matters. Semler Brossy is retained directly by the Committee, which has the sole authority to review and approve the budget of the independent consultant. Semler Brossy does not advise our management and receives no other compensation from us. The same Semler Brossy principal attended all eight of the Committee meetings in 2018. The Committee has analyzed whether the work of Semler Brossy as a compensation consultant has raised any conflict of interest, taking into consideration the following factors: (i) the provision of any other services to the Company by Semler Brossy; (ii) the amount of fees the Company paid to Semler Brossy as a percentage of the firm's total revenue; (iii) Semler Brossy's policies and procedures that are designed to prevent conflicts of interest; (iv) any business or personal relationship of Semler Brossy or the individual compensation advisor employed by the firm with an executive officer of the Company; (v) any business or personal relationship of the individual compensation advisor with any member of the Committee; and (vi) any stock of the Company owned by Semler Brossy or the individual compensation advisor employed by the firm. The Committee has determined, based on its analysis of the above factors, that the work of Semler Brossy and the individual compensation advisor employed by Semler Brossy as compensation consultant to the Committee has not created any conflict of interest. In addition, the Committee reviewed survey data provided by the Willis Towers Watson Executive Compensation Database (see Competitive Survey on pp. 43-44). Willis Towers Watson does not make recommendations to, nor does it assist, the Committee in determining compensation of executive officers. Willis Towers Watson is retained by Ford management, not the Committee. Committee meetings typically occur prior to the meetings of the full Board of Directors. Incentive Bonus targets and awards, Performance Unit grants, Time-Based Units, and cash awards typically are decided at the February or March Committee meeting (see Timing of Awards on pp. 46-47). Officer salaries are reviewed in February each year. See the Compensation Discussion and Analysis on pp. 38-59 for more detail on the factors considered by the Committee in making executive compensation decisions. A majority of the directors must be independent directors under applicable SEC and NYSE Listed Company rules. These rules provide that no director can qualify as independent unless the Board affirmatively determines that the director has no material relationship with the listed company. The Board has adopted the following standards in determining whether or not a director has a material relationship with the Company. These standards are contained in Ford's Corporate Governance Principles and may be found at the Company's website, www.corporate.ford.com. for prior service (provided such compensation is not contingent in any way on continued service). Sales and Purchases of Products/Services. If within the preceding three years a Ford director was an executive officer or employee of another company (or an immediate family member of the director was an executive officer of such company) that did business with Ford and either: (a) the annual sales to Ford were less than the greater of $1 million or two percent of the total annual revenues of such company, or (b) the annual purchases from Ford were less than the greater of $1 million or two percent of the total annual revenues of Ford, in each case for any of the three most recently completed fiscal years. Indebtedness. If within the preceding three years a Ford director was an executive officer of another company which was indebted to Ford, or to which Ford was indebted, and either: (a) the total amount of such other company's indebtedness to Ford was less than two percent of the total consolidated assets of Ford, or (b) the total amount of Ford's indebtedness to such other company was less than two percent of the total consolidated assets of such other company, in each case for any of the three most recently completed fiscal years. Based on these independence standards and all of the relevant facts and circumstances, the Board determined that none of the following directors had any material relationship with the Company and, thus, are independent: Stephen G. Butler, Kimberly A. Casiano, Anthony F. Earley, Jr., William W. Helman IV, William E. Kennard, John C. Lechleiter, Ellen R. Marram, John L. Thornton, John B. Veihmeyer, Lynn M. Vojvodich, and John S. Weinberg. Additionally, the Board has determined that each of Stephen G. Butler, Kimberly A. Casiano, John B. Veihmeyer, and Lynn M. Vojvodich is independent under the heightened SEC independence standards for audit committees and that each of Anthony F. Earley, Jr., John C. Lechleiter, Ellen R. Marram, and John L. Thornton is independent under the additional NYSE independence standards for compensation committees. From time to time during the past three years, Ford purchased goods and services from, sold goods and services to, or financing arrangements were provided by, various companies with which certain directors were or are affiliated either as a member of such company's board of directors or, in the case of Messrs. Earley and Weinberg, as an officer of such a company. In addition to Messrs. Earley and Weinberg, these directors included Mr. Kennard, Ms. Marram, and Mr. Thornton. The Company also made donations to certain institutions with which certain directors are affiliated. These included Ms. Casiano, Mr. Earley, Dr. Lechleiter, Mr. Thornton and Mr. Veihmeyer. In addition, the Company made charitable donations in each director's name in lieu of holiday gifts. None of the relationships described above was material under the independence standards contained in our Corporate Governance Principles. accounting, internal controls, auditing, or other matters, to the following address: Board of Directors (or Lead Independent Director or non-employee Directors as a group, as appropriate), Ford Motor Company, P.O. Box 685, Dearborn, MI 48126-0685. You may submit your concern anonymously or confidentially. You may also indicate whether you are a shareholder, customer, supplier, or other interested party. you can send communications to the Board on the Company's website (www.corporate.ford.com). All members of the Board are expected to participate in the annual meeting, unless unusual circumstances would prevent such participation. Last year, of the fourteen then current members of the Board, thirteen attended the virtual annual meeting. Pursuant to SEC filings, the Company was notified that as of December 31, 2018, the entities included in the table below had more than a 5% ownership interest of Ford common stock, or owned securities convertible into more than 5% ownership of Ford common stock, or owned a combination of Ford common stock and securities convertible into Ford common stock that could result in more than 5% ownership of Ford common stock. State Street Bank and Trust Company is the trustee for Ford common stock in the Ford defined contribution plans master trust, which beneficially owns 4.3% of the common stock of Ford. In this capacity, State Street Bank and Trust Company has voting power over the shares in certain circumstances. As of February 1, 2019, the persons included in the table below beneficially owned more than 5% of the outstanding Class B Stock. Includes shares beneficially owned in either an individual or fiduciary capacity as sole trustee or as a co-trustee. Represents beneficial ownership of shares held in a fiduciary capacity as sole trustee or as a co-trustee. Mr. Larsen disclaims beneficial ownership of these shares. The following table shows how much Ford stock each current director, nominee, and Named Executive beneficially owned as of February 1, 2019. No director, nominee, or executive officer, including Named Executives, beneficially owned more than 0.12% of Ford's total outstanding common stock nor did any such person beneficially own more than 0.01% of Ford common stock units as of February 1, 2019. Executive officers held options exercisable on or within 60 days after February 1, 2019 to buy 4,915,046 shares of Ford common stock. For executive officers, included in the amounts for "All Directors and Executive Officers as a group" are Restricted Stock Units issued under our Long-Term Incentive Plans ("LTI Plans") as long-term incentive grants in 2018 and prior years for retention and other incentive purposes. In addition, amounts shown include Restricted Stock Units issued under the LTI Plans as follows: 502,370 units for Mr. Shanks; 585,790 units for William Clay Ford, Jr.; 676,474 units for Mr. Farley; 675,979 units for Mr. Hinrichs; and 738,059 units for Mr. Hackett. In addition, amounts shown include Restricted Stock Units issued under the 2014 Stock Plan for Non-Employee Directors of Ford Motor Company ("2014 Plan") as follows: 123,196 units for Mr. Butler; 78,730 units for Ms. Casiano; 91,391 units for Mr. Earley; 66,519 units for Mr. Kennard; 122,896 units for Dr. Lechleiter; 78,730 units for Ms. Marram; 20,894 units for Mr. Veihmeyer; 35,739 units for Ms. Vojvodich; and 66,364 units for Mr. Weinberg. Included in the stock ownership shown in the table above: Edsel B. Ford II has disclaimed beneficial ownership of 393,285 shares of common stock and 959,895 shares of Class B Stock that are either held directly by his immediate family or by charitable funds which he controls. William Clay Ford, Jr., has disclaimed beneficial ownership of 953,775 shares of Class B Stock that are either held directly by members of his immediate family or indirectly by members of his immediate family in trusts in which Mr. Ford has no interest. Present directors and executive officers as a group have disclaimed beneficial ownership of a total of 393,285 shares of common stock and 1,913,670 shares of Class B Stock. Based on Company records and other information, Ford believes that all SEC filing requirements applicable to its directors and executive officers were complied with for 2018 and prior years. In February 2002, Ford entered into a Stadium Naming and License Agreement with The Detroit Lions, Inc. (the "Lions"), pursuant to which we acquired for $50 million, paid by us in 2002, the naming rights to a new domed stadium located in downtown Detroit at which the Lions began playing their home games during the 2002 National Football League season. We named the stadium "Ford Field." The term of the naming rights agreement is 25 years, which commenced with the 2002 National Football League season. Benefits to Ford under the naming rights agreement include exclusive exterior entrance signage and predominant interior promotional signage. Beginning in 2005, the Company also agreed to provide to the Lions, at no cost, eight new model year Ford, Lincoln or Mercury brand vehicles manufactured by Ford in North America for use by the management and staff of Ford Field and the Lions and to replace such vehicles in each second successive year, for the remainder of the naming rights agreement. The cost incurred during 2018 was $63,509. William Clay Ford, Jr., is a minority owner and is a director and officer of the Lions. college football "Bowl" game to be played in each of the 2014-2016 seasons at Ford Field. We named the Bowl the "Quick Lane Bowl" for our Quick Lane Tire & Auto Center brand and acquired several broadcast television messages, event signage, and other advertising in exchange for a sponsorship fee. In 2016, the Company extended its sponsorship of the Quick Lane Bowl for another three years to cover the 2017-2019 seasons. The cost incurred during 2018 was $681,000. Paul Alandt, Lynn F. Alandt's husband, is a minority owner of two Ford franchised dealerships and a Lincoln franchised dealership. In 2018, Ford charged the dealerships about $165.6 million for products and services in the ordinary course of business. In turn, Ford paid the dealerships about $37.7 million for services in the ordinary course of business. Also in 2018, Ford Motor Credit Company LLC, a wholly owned entity of Ford, provided about $276.3 million of financing to dealerships owned by Mr. Alandt and paid about $1.4 million to them in the ordinary course of business. The dealerships paid Ford Credit about $286.1 million in the ordinary course of business. Additionally, in 2018, Ford Credit purchased retail installment sales contracts and Red Carpet Leases from the dealerships in amounts of about $19.0 million and $111.0 million, respectively. In March 2001, Marketing Associates, LLC (dba OneMagnify), an entity in which Edsel B. Ford II and his family have a controlling equity interest, acquired all of the assets of the Marketing Associates Division of Lason Systems, Inc. Before the acquisition, the Marketing Associates Division of Lason Systems, Inc. provided various marketing and related services to the Company and this continued following the acquisition. In 2018, the Company paid Marketing Associates, LLC approximately $62.4 million for marketing and related services provided in the ordinary course of business. In April 2016, the Company approved an investment of up to $10 million over five years in Fontinalis Capital Partners II, a venture capital fund that invests in next-generation mobility start-up entities. As of March 1, 2019, we have invested $8.3 million. Our investment has yielded several benefits, including: (i) increased early exposure to possible mobility investments; (ii) the ability to invest directly in an entity whether or not the investment fund invests in the entity; and (iii) increased exposure to venture capital mobility expertise. As of January 1, 2019, William Clay Ford, Jr. had a 7.85% interest and Lynn F. Alandt had a 4% interest in the investment fund. TransLoc Inc., a software company providing demand-response transit solutions, data solutions and other tools to improve operational efficiency for business-to-government and business-to-business customers. TransLoc will accelerate growth in key areas of our mobility strategy and we obtained key talent for positions within our mobility team. Fontinalis Capital Partners II owned 14.5% of TransLoc on the date of acquisition. As of January 1, 2018, William Clay Ford, Jr. had a 7.85% interest and Lynn F. Alandt had a 4% interest in Fontinalis Capital Partners II. During 2018, the Company employed Henry Ford III, son of Edsel B. Ford II, as an Associate Director in our global Corporate Strategy skill team. Henry Ford III received 2018 compensation of approximately $201,829 consisting primarily of salary, bonus, and stock awards. During 2018, the Company employed the husband of Marcy S. Klevorn, President, Mobility, as a Senior Project Manager in our Information Technology skill team. He received 2018 compensation of approximately $169,569 consisting primarily of salary and bonus. During 2018, the Company employed Alexandra Ford English, daughter of William Clay Ford, Jr., as a member of our Automated Vehicle Business Team. Ms. Ford English received 2018 compensation of approximately $171,000, consisting primarily of salary and bonus. During 2018, the Company employed the husband of Catherine O'Callaghan, Vice President and Controller, as a Manager, Marketing Sales & Service. He received 2018 compensation of approximately $454,222, consisting primarily of salary, bonus, and stock awards. Pursuant to SEC filings, the Company was notified that as of December 31, 2018, State Street Corporation, and its affiliate State Street Bank and Trust Company, State Street Financial Center, One Lincoln Street, Boston, MA 02111, and certain of its affiliates, owned approximately 9.1% of our common stock. During 2018, the Company paid State Street Corporation and its affiliates approximately $2.8 million in the ordinary course of business. Pursuant to SEC filings, the Company was notified that as of December 31, 2018, BlackRock, Inc., 55 East 52nd Street, New York, NY 10022, and certain of its affiliates, owned approximately 6.9% of the Company's common stock. During 2018, the Company paid BlackRock, Inc. approximately $10.3 million in the ordinary course of business. Thirteen directors will be elected at this year's annual meeting. Each director will serve until the next annual meeting or until he or she is succeeded by another qualified director who has been elected. Ms. Marram, having reached our mandatory retirement age of 72, will not stand for re-election at the 2019 Annual Meeting of Shareholders. Each of the nominees for director is now a member of the Board of Directors, which met nine times during 2018. Each of the nominees for director attended at least 75% of the combined Board and committee meetings held during the periods served by such nominee in 2018. The nominees provided the following information about themselves as of the latest practical date. Additionally, for each director nominee we have disclosed the particular experience, qualifications, attributes, or skills that led the Board to conclude that the nominee supports the Company's strategy and thus, should serve as a director. Reasons for Nomination: Ms. Casiano has extensive domestic and international experience in marketing and sales, particularly in the U.S. Hispanic community and Latin America. Ford benefits from Ms. Casiano's global business and executive experience cultivated through years spent managing her own company. Ms. Casiano consistently provides Ford with valuable insight in our where to play and how to win analyses and enterprise risk management systems. Experience: Mr. Earley was the Executive Chairman of PG&E Corporation from March 2017 until December 2017. From September 2011 until February 2017, he served as the Chairman, Chief Executive Officer, and President of PG&E Corporation, which filed for bankruptcy on January 29, 2019 as a result of potential liabilities for wildfires in California. Before joining PG&E Corporation, Mr. Earley served in a number of executive leadership roles at DTE Energy including Executive Chairman, Chairman, Chief Executive Officer, President, and Chief Operating Officer. In addition, Mr. Earley served as President and Chief Operating Officer of Long Island Lighting Company. Mr. Earley also served as an officer in the United States Navy nuclear submarine program where he was qualified as a chief engineer officer. Reasons for Nomination: Mr. Ford has a wealth of valuable experience in the automotive industry. During his time as an executive at the Company and as a consultant for the Company, he developed deep knowledge of the Company's business. Mr. Ford's life-long affiliation with the Company provides the Board with a unique historical perspective and a focus on the long-term interests of the Company. Mr. Ford also adds significant value in various stakeholder relationships, both domestically and abroad, including relationships with dealers, non-government organizations, employees, and the communities in which Ford has a significant presence. In addition, Mr. Ford's experience in creative and technology-driven marketing allows him to provide valuable insight in developing marketing and vehicle distribution strategies. Experience: Mr. Hackett was elected President and Chief Executive Officer of Ford Motor Company in May 2017. Since March 2016, Mr. Hackett served as Chairman of Ford Smart Mobility LLC, a subsidiary of Ford formed to accelerate the Company's plans to design, build, grow, and invest in emerging mobility services. Prior to joining Ford Smart Mobility, Mr. Hackett was a member of the Ford Motor Company Board of Directors starting in 2013. As a member of the Sustainability and Innovation Committee, he was actively involved with the Ford senior leadership team in launching the Company's Ford Smart Mobility plan. He also served on the Audit and the Nominating and Governance Committees. Mr. Hackett was vice chairman of Steelcase, a global leader in the office furniture industry, from 2014 to 2015. He retired as Chief Executive Officer of Steelcase in February 2014, after having spent 20 years leading the Grand Rapids-based office furniture company. Reasons for Nomination: As a consumer-focused visionary, Mr. Hackett is credited with guiding Steelcase to becoming a global leader in the office furniture industry. During his 30 years there, he helped transform the office furniture company from traditional manufacturer to industry innovator. Having spent his career focused on the evolving needs of consumers, Mr. Hackett is equipped to lead the Company's commitment to becoming the world's most trusted company, designing smart vehicles for a smart world that help people move more safely, confidently, and freely. Experience: Mr. Helman is a General Partner at Greylock Partners, a venture capital investment firm focused on early stage investments in technology, enterprise software and consumer internet. He joined Greylock in 1984 and served as Managing Partner from 1999 to 2013. Mr. Helman is on the board of the Broad Institute. Reasons for Nomination: Mr. Helman's experience with technology investments and social media marketing provides a unique and valued perspective as these issues are becoming increasingly important as the auto industry adopts new technologies, develops innovative solutions to personal mobility challenges, and adapts to new social media techniques. Mr. Helman's expertise in investing in new innovations offers the Board valuable insight as Ford continues to invest in connectivity and mobility technologies in order to deliver innovative products our customers want and value. Experience: Mr. Kennard is the Chairman and co-founder of Velocitas Partners LLC, an asset management firm. Mr. Kennard served as chairman of the U.S. Federal Communications Commission (FCC) from 1997 to 2001 and served as the FCC's general counsel from 1993 to 1997. As U.S. Ambassador to the European Union from 2009 to 2013, he worked to eliminate regulatory barriers to commerce and to promote transatlantic trade, investment, and job creation. In addition to his public service, Mr. Kennard was a managing director of The Carlyle Group from 2001 to 2009 where he led investments in the telecommunications and media sectors. He also serves as a trustee of Yale University. Reasons for Nomination: Mr. Kennard has extensive experience in the public policy, law, telecommunications, and private equity fields. In particular, he has shaped policy and pioneered initiatives to help technology benefit consumers worldwide. Mr. Kennard is regarded as a champion for consumers in the digital age, and we believe this expertise, unique perspective, and first-hand knowledge of the technological regulatory landscape help guide our strategy as we accelerate our innovative work in the areas of in-car connectivity and mobility solutions in a smart world. Experience: Dr. Lechleiter retired as Eli Lilly and Company's President and Chief Executive Officer on December 31, 2016, after 37 years with the company. He also served as Chairman of the Board of Directors of Lilly from 2009 through May 2017. Dr. Lechleiter joined Lilly in 1979 as a senior organic chemist in process research and development and became head of that department in 1982. In 1984, he began serving as director of pharmaceutical product development for the Lilly Research Center. He later held roles in project management, regulatory affairs, product development, and pharma operations. In 2005, he was named Lilly's President and Chief Operating Officer and joined the Board of Directors. Dr. Lechleiter is a member of the American Chemical Society. He serves on the boards of United Way Worldwide, the Indiana Economic Development Corporation, Battelle, Indiana Biosciences Research Institute, and Lilly Endowment, Inc. He is a member emeritus of the board of the Central Indiana Corporate Partnership. Reasons for Nomination: Dr. Lechleiter's experience as a chairman and chief executive officer of a multinational company and his knowledge of science, marketing, management, and international business aid the Board in its deliberations. Dr. Lechleiter's background and experience in research and development also provide the Company with meaningful insight as it accelerates the development of new products. Additionally, Dr. Lechleiter's extensive experience in a highly regulated industry operating in a changing landscape will assist the Board as the Company adapts to an increasingly complex and dynamic environment, both in the core business and autonomous vehicles. Experience: Mr. Thornton has served as Executive Chairman of Barrick Gold Corporation since April 2014. He also serves as Chairman of Silk Road Finance Corporation, an Asian investment firm, and Non-Executive Chairman of PineBridge Investments, a global asset manager. He is a Professor, Director of the Global Leadership Program, and a Member of the Advisory Board of the Tsinghua University School of Economics and Management in Beijing. He is also Chairman Emeritus of the Brookings Institution in Washington, D.C. Mr. Thornton retired as President and Director of The Goldman Sachs Group, Inc. in 2003. Mr. Thornton also previously served as Chairman of Goldman Sachs Asia and as Co-Chief Executive of Goldman Sachs International, overseeing the firm's business in Europe, the Middle East, and Africa. Mr. Thornton is Co-Chair of the Asia Society, and is also a trustee, advisory board member or member of, the China Investment Corporation (CIC), Confucius Institute Headquarters, King Abdullah University of Science and Technology, McKinsey Advisory Council, Schwarzman Scholars, and the African Leadership Academy. He is also Vice Chairman of the Morehouse College Board of Trustees. Reasons for Nomination: Mr. Thornton has extensive international business and financial experience. Mr. Thornton brings valuable insight into emerging markets gained through his oversight of the presence of Goldman Sachs International on multiple continents. Mr. Thornton's extensive experience in finance and business matters, both domestically and internationally, is critical to achieving our fitness goals of financing our long-term strategic plan, improving our balance sheet, and creating profitable growth. Mr. Thornton's unique knowledge brings to the Board valuable insight in international business, especially in China, which has become one of the world's most important automotive growth markets. Experience: Mr. Veihmeyer served as Chairman of KPMG International from 2014 until his retirement after 40 years with KPMG in September 2017. Before becoming global chairman, Mr. Veihmeyer held numerous leadership roles at KPMG, including U.S. Chairman and Chief Executive Officer from 2010 to 2015, U.S. Deputy Chairman, managing partner of KPMG's Washington, D.C. operations, and global head of Risk Management and Regulatory. Mr. Veihmeyer currently serves as a Trustee of the Financial Accounting Foundation, which oversees the Financial Accounting Standards Board. He is also a member of the Board of Trustees of the University of Notre Dame. Reasons for Nomination: Mr. Veihmeyer has extensive experience in the accounting profession, both in the United States and internationally, as well as executive leadership experience as Chairman and Chief Executive Officer of KPMG. His experience leading KPMG, which has member firms in over 150 countries, has provided Mr. Veihmeyer with significant exposure to business operations in every region of the world. Mr. Veihmeyer also previously served on the board of Catalyst, Inc. and has been recognized for his leadership in diversity and inclusion. Mr. Veihmeyer's financial expertise, executive leadership experience, risk management skills, and international exposure bring value to the Company's Board at an unprecedented time of disruption in the automotive industry and in an increasingly complex regulatory environment. Reasons for Nomination: Ms. Vojvodich has a wealth of expertise in marketing technology and innovation, market analysis, and the software industry. As Ford continues to transform itself into the world's most trusted company, Ms. Vojvodich provides valuable guidance regarding how the Company should market and position itself in its automotive and mobility businesses, including the use of digital strategies. Ms. Vojvodich's experience advising start-up and growth-stage technology businesses lends itself to the Company as it continues culture-shaping initiatives to attract talent and deliver a broader suite of mobility products and services. Experience: Mr. Weinberg became Chairman of the Board of Directors and Executive Chairman of Evercore Inc. in November 2016. Previously, Mr. Weinberg served as Vice Chairman of the Goldman Sachs Group from June 2006 until October 2015. His career at Goldman Sachs spanned more than three decades, with the majority of his time spent in the banking division. Mr. Weinberg currently serves as a board member of New York-Presbyterian Hospital and Middlebury College. He also is a member of the Investment Committee of the Cystic Fibrosis Foundation. Reasons for Nomination: Mr. Weinberg has extensive experience in finance, banking, and capital markets, as well as a deep understanding of Ford, its history, and the needs of its business. During his time with Goldman Sachs, Mr. Weinberg served as a trusted advisor to Ford and other manufacturing clients. As Ford transforms itself into the world's most trusted company, making smart cars for a smart world, Mr. Weinberg's financial expertise will aid the Company in rapidly improving our fitness to lower costs, reallocate capital, and finance our business plan. Current Public Company Directorships: Evercore Inc.
As discussed in footnote 2 below, certain directors chose to receive all or a portion of their fees in restricted stock units pursuant to the 2014 Plan in addition to the mandatory portion. Pursuant to SEC rules, the dollar value of any fees any director elected to receive in restricted units in excess of the fees mandatorily paid in restricted stock units pursuant to that plan is shown in the "Fees Earned or Paid in Cash" column. 2014 Plan. Effective January 1, 2014, the Board adopted the 2014 Stock Plan for Non-Employee Directors of Ford Motor Company. The 2014 Plan was approved by shareholders at the 2014 Annual Meeting. The 2014 Plan is structured so that approximately 68% (the "mandatory portion") of the Annual Board membership fee is mandatorily paid in Restricted Stock Units ("RSUs"). The amounts shown in column (c) are the grant date values of the RSUs relating to the mandatory portion of fees paid under the 2014 Plan. Each Director also had the option of having some or all of his or her remaining fees paid in RSUs pursuant to the 2014 Plan. The RSUs vest immediately upon grant. Each Director had the option to choose when the RSUs settle into shares of Ford common stock as follows: (i) immediately on the grant date; (ii) the earlier of five years from the date of grant and separation from the Board; or (iii) at separation from the Board. The Board adopted the 2014 Plan because the RSUs settle in shares of common stock, thus further aligning the interests of directors and shareholders. Directors are not permitted to sell, hedge, or pledge the mandatory portion of the Annual Board fees until after separation from the Board, even if the RSUs settle into shares of common stock prior to separation from the Board. In light of the requirement that approximately 68% of annual director fees are paid in RSUs, and that directors may not dispose of such RSUs or shares of stock until after separation from the Board, there is no minimum share ownership requirement for members of the Board. If dividends are paid on common stock, Dividend Equivalents are paid in additional RSUs on RSU balances for those directors whose RSUs have not settled into shares of common stock. For any directors whose RSUs have settled into shares of common stock, they are required to reinvest those dividends into additional shares of common stock until separation from the Board. The amount shown for Edsel B. Ford II reflects the fees he earned pursuant to a January 1999 consulting agreement between the Company and Mr. Ford. The consulting fee is payable quarterly in arrears in cash. Mr. Ford is available for consultation, representation, and other duties under the agreement. Additionally, the Company provides facilities (including office space) and an administrative assistant to Mr. Ford. This agreement will continue until either party ends it with 30 days' notice. and insurance. We provide non-employee directors with the use of up to two Company vehicles free of charge. Directors are expected to provide evaluations of the vehicles to the Company. The cost of providing these vehicles is included in column (d). The Audit Committee of the Board of Directors selects and hires the independent registered public accounting firm. You must ratify the Audit Committee's selection for 2019. The Audit Committee selected PricewaterhouseCoopers LLP ("PricewaterhouseCoopers") to perform an independent audit of the Company's consolidated financial statements and internal control over financial reporting in accordance with standards established by the Public Company Accounting Oversight Board for 2019. PricewaterhouseCoopers is well qualified to serve as our independent registered public accounting firm. Representatives of PricewaterhouseCoopers will be present at the meeting with the opportunity to make a statement and answer appropriate questions. Amounts paid by the Company to PricewaterhouseCoopers for audit and non-audit services rendered in 2018 and 2017 are disclosed in the table below. "RESOLVED, That the selection, by the Audit Committee of the Board of Directors, of PricewaterhouseCoopers LLP as the independent registered public accounting firm to perform an independent audit of the Company's consolidated financial statements and internal control over financial reporting in accordance with standards established by the Public Company Accounting Oversight Board for 2019 is ratified." Committee for approval during the next regularly scheduled meeting. In addition, all new engagements greater than $250,000 will be presented in advance to the Audit Committee for approval. A regular report is prepared for each regular Audit Committee meeting outlining actual fees and expenses paid or committed against approved fees. The Audit Committee approved of all of the fees listed in the table below. Consists of assistance with tax compliance and the preparation of tax returns, tax consultation, planning, and implementation services, assistance in connection with tax audits, and tax advice related to mergers, acquisitions and divestitures. Of the fees paid for tax services, we paid 59% and 58% for tax compliance and preparation of tax returns in 2018 and 2017, respectively. The Audit Committee is composed of four directors, all of whom meet the independence standards contained in the NYSE Listed Company rules, SEC rules, and Ford's Corporate Governance Principles, and operates under a written charter adopted by the Board of Directors. A copy of the Audit Committee Charter may be found on the Company's website, www.corporate.ford.com. The Audit Committee selects, subject to shareholder ratification, the Company's independent registered public accounting firm. Ford management is responsible for the Company's internal controls and the financial reporting process. The independent registered public accounting firm, PricewaterhouseCoopers, is responsible for performing independent audits of the Company's consolidated financial statements and internal controls over financial reporting and issuing an opinion on the conformity of those audited financial statements with United States generally accepted accounting principles and on the effectiveness of the Company's internal controls over financial reporting. The Audit Committee monitors the Company's financial reporting process and reports to the Board of Directors on its findings. PricewaterhouseCoopers has served as the Company's independent registered public accounting firm since 1946.
year ended December 31, 2018. The Audit Committee also discussed with PricewaterhouseCoopers the matters required to be discussed by applicable requirements of the Public Company Accounting Oversight Board regarding the independent registered public accounting firm's communications with the Audit Committee, as well as by SEC regulations. In conjunction with the mandated rotation of PricewaterhouseCoopers's lead engagement partner, the Audit Committee and its chairperson are also directly involved in the selection of PricewaterhouseCoopers's new lead engagement partner. PricewaterhouseCoopers submitted to the Audit Committee the written disclosures and the letter required by applicable requirements of the Public Company Accounting Oversight Board regarding the independent registered public accounting firm's communications with the Audit Committee concerning independence. The Audit Committee discussed with PricewaterhouseCoopers such firm's independence. In order to assure continuing auditor independence, the Audit Committee periodically considers whether there should be a regular rotation of the independent registered public accounting firm. Based on the reviews and discussions referred to above, the Audit Committee recommended to the Board of Directors that the audited financial statements be included in the Company's Annual Report on Form 10-K for the year ended December 31, 2018, filed with the SEC. "RESOLVED, That the Company's shareholders approve, on an advisory basis, the compensation of the Named Executives, as disclosed in the Company's Proxy Statement for the 2019 Annual Meeting of Shareholders pursuant to the compensation disclosure rules of the SEC, including the Compensation Discussion and Analysis, the Summary Compensation Table, and the other related tables and disclosure." Our Belief: Ford Motor Company was built on the belief that freedom of movement drives human progress. Our Aspiration: To become the world's most trusted company, designing smart vehicles for a smart world. Our Plan for Value Creation: The plan to reach our aspiration and create value involves engaging our passion for product and deep customers insight, focusing on fitness and tracking our success against key metrics. Our People: The foundation for delivering on our plan is and will always be our people. by Company Revenue, Company Adjusted EBIT Margin, Company Operating Cash Flow, Adjusted Return On Invested Capital, and ultimately achieving superior Total Shareholder Returns ("TSR") among our peer group. We started our transition in 2017, and in 2018 we set the foundation for our future of becoming the world's most trusted company, designing smart vehicles for a smart world. The graphic below shows our operational performance over the past several years. We have built a solid foundation on which to launch our strategic choices for the future. See pages 27 and 74 of Ford's 2018 Form 10-K for definitions and reconciliations to GAAP. Our 2018 Company Revenue was higher than 2017. Net income was $3.7 billion and Company adjusted EBIT was $7.0 billion. Company Adjusted EBIT Margin was 4.4%. Company adjusted operating cash flow was positive $2.8 billion. From our perspective, results were disappointing with all key metrics down from the prior year other than Company Revenue. The NEO Compensation section of the CD&A (pp. 48-58), reflects our performance against metrics over the 2018 performance period for the Incentive Bonus Plan and the 2016-2018 performance period for the 2016 Performance Unit grant. The information in this Performance Section shows we continue to deliver positive results over a sustained time period. In order to create greater value for our stakeholders, it is important that we attack costs as well as redesign our business operations to take advantage of future growth opportunities. The following graphics show some of our achievements in these areas and the strategic choices we are making to drive future growth. Achieving superior shareholder returns is what the employees of Ford strive for each day, and we realize that our TSR has lagged that of our peer group and the S&P 500 over the most recently completed one-, three-, and five-year periods. Our efforts to become more fit and to strengthen those areas of our business where we are winning  primarily through the Creating Tomorrow, Together strategy (see p. 38)  is expected to provide the profits necessary to invest in the future of winning propulsion choices, autonomous technologies, and mobility experiences. We will continue to implement this strategy with a passion for product and keen focus on customer insights that will differentiate us from our competition and position us to deliver value for all of our stakeholders. Our operating performance affects our TSR and we tie operating performance to our incentive plan payouts. Our Performance Unit grants include internal financial metrics and relative TSR as factors. Thus, payouts under the 2016 Performance Unit grant, which occurred in March 2019, reflect actual relative TSR performance against our peer group as constituted in 2016. This links our executives' performance to shareholder interests, which is a key tenet of our pay-for-performance philosophy (see 2016 Performance Unit Results on p. 55-56 for a discussion of the 2016 Performance Unit payout). earnings per share and Company Adjusted Operating Cash Flow. Shareholders have benefited from our results. Since reinstituting dividends in 2012, we have returned $18.4 billion to shareholders through year-end 2018 through dividends and share buybacks. We maintained our regular quarterly dividend of $0.15 per share throughout 2018 and paid a supplemental dividend of $0.13 per share in the first quarter. In the first quarter of 2019, we maintained the $0.15 per share regular dividend. Looking ahead, 2019 is about implementation. 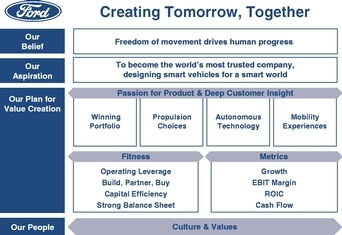 A year where our thinking about the future of Ford  the fundamental redesign of the business, our capital allocation choices, our fitness, our alliance choices  become increasingly clear. Our capital allocation priorities include funding our traditional product and non-product investment plans, our growth plans for electrification, autonomy and mobility, and shareholder distributions. We believe focusing on these priorities will create value for all of our stakeholders. Please refer to Appendix II for a Cautionary Note on Forward-Looking Statements. Our Global Compensation and Benefits Philosophy, Strategy, and Guiding Principles are the pillars that provide the foundation upon which compensation and benefits programs are developed at Ford. The Guiding Principles ensure our Philosophy and Strategy statements are applied consistently across the business for our salaried employees. Driving total shareholder return is inherent in each pillar. They work together  no one principle is more important than any other, and business judgment is used to balance them to ensure our compensation and benefit programs are effective in supporting our strategy. The Compensation Committee of the Board of Directors regularly reviews the Global Philosophy, Strategy, and Guiding Principles and, in connection with its review of our gender pay equity practices during 2018, determined to include a statement on gender pay equity. In addition, the Committee updated the language to reflect our overall strategic direction. These changes reinforce that pay equity is an important objective that will attract top talent to Ford, and reinforces that compensation practices are tied to our strategy. The changes the Committee approved are highlighted in blue below. Global Compensation and Benefits Philosophy: Ford Motor Company was built on the belief that freedom of movement drives human progress. It is a belief that has always fueled our passion to create great cars and trucks. And today, it drives our commitment to become the world's most trusted company, designing smart vehicles for a smart world that help people move more safely, confidently and freely. We cannot compete for the future we envision unless we are fit in all aspects of our business. commitment to equal opportunity in all aspects of employment, including the way Ford compensates its employees. A consistent framework that is affordable to the business. A pay for performance focus  individuals are rewarded for performance and contributions to business success. Compensation is fair and equitable, irrespective of gender, race, or similar personal characteristics. A total package that will be competitive with leading companies. Global Compensation and Benefits Strategy: Compensation will be used to attract, retain, and motivate employees and to reward the achievement of business results through the delivery of competitive pay and incentive programs. Benefits provide employees with income security and protection from catastrophic loss. The Company will develop affordable, competitive benefit programs that meet these objectives. Pay Equity.Ford employee compensation in each market should be fair and equitable, irrespective of gender, race, or similar personal characteristics. This applies to all forms of pay, including base salary, incentives, bonuses, and other forms of compensation. Performance Orientation. Compensation programs should support and reinforce a pay-for-performance culture. They should motivate and reward employees for achieving desired business results. Benefit programs should provide income security and support/protect for catastrophic loss. Competitive Positioning. Competitive compensation and benefit programs are critical to attracting, motivating, and retaining a high performing workforce. We target the average competitive level of automotive and other leading companies within the national market, including large automotive, leading multinational, and other selected companies, as appropriate. Competitiveness will be measured based on program value to employees relative to the comparator group. When business conditions are such that our incentive programs do not provide competitive compensation on a longer-term basis, we will use short-and long-term retention programs to ensure the Company retains key employees who enable the Company to respond successfully to financial and operational challenges. Affordability. Compensation and benefits must be affordable to the Company over the medium- to long-term. To the extent possible, compensation and benefit programs will not fluctuate significantly based on short-term business conditions. Desired Behaviors. Compensation and benefit programs should support the Company's business performance objectives and promote desired behaviors. Flexibility. Compensation, benefit, and other related programs should take into account workforce diversity and provide meaningful individual choice where appropriate. Consistency and Stability. It is a Company objective to provide consistent and stable programs globally (subject to legal, competitive, and cultural constraints), particularly for higher level positions. Compensation and benefit programs should have a high degree of consistency within countries (i.e., among various pay levels and employee groups) and should not fluctuate significantly year-over-year. Programs may vary when competitively driven. Delivery Efficiency. Compensation, benefit, and other related programs should be understandable and easy to administer while leveraging economies of scale and technology. They should be implemented in a consistent, equitable, and efficient manner. Programs will be delivered in a manner that is tax-effective to the Company and employees as far as practicable. Delivery Effectiveness. Clearly defined metrics should be developed for compensation, benefit, and other related programs that are aligned with corporate business performance metrics. Metrics are designed and utilized to measure and continually improve business results. In keeping with the above, our total direct compensation for Named Executives, consisting of base salary, annual cash incentive, and long-term equity incentive, is heavily weighted towards performance. 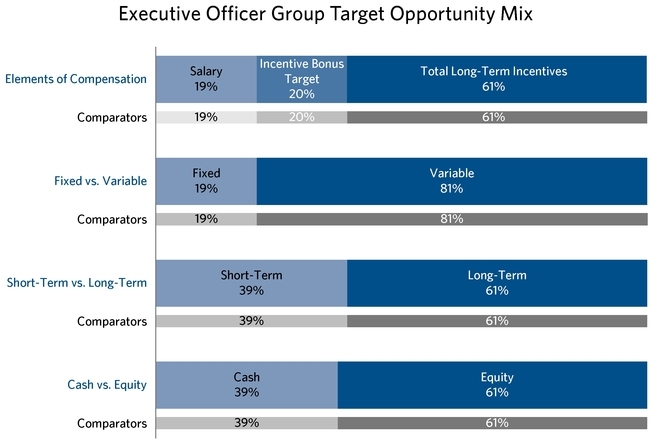 Base salary represents 20% or less of each Named Executive's target opportunity, and a majority of our executives' target compensation is contingent on meeting incentive plan metrics. The Committee considered recommendations from the Executive Chairman, the President and CEO, and the Chief Human Resources Officer, in developing compensation plans and evaluating performance of executive officers. The Committee's independent consultant also provides advice and analyses on the structure and level of executive compensation (see Compensation Committee Operations on pp. 16-17). Our senior leadership team established our corporate priorities and developed the 2018 business plan metrics, which were approved at the December 2017 Board meeting. Our Human Resources and Finance departments developed the incentive plan performance weightings, targets, and payout ranges in support of the business plan and in December 2017 presented the recommendations to the Committee. Final decisions on the design of our incentive plans and all major elements of compensation, however, as well as total compensation for each executive officer, were made by the Compensation Committee at the February and March 2018 meetings. distributions (cash flow), quality, and effectiveness of capital allocation (return on invested capital). With those priorities in mind, the Committee adopted metrics and weightings shown in the following table for the 2018 Incentive Bonus Plan and Performance Unit grants. Please refer to 2018 Incentive Bonus Plan Results on pp. 51-52 for details on our performance against metrics and payouts under our Incentive Bonus Plan for 2018. Also, refer to 2016 Performance Unit Results on pp. 55-56 for details on our performance against metrics and payouts for the 2016-2018 performance period. survey group compensation data was collected during the second quarter of 2017 and, therefore, reflected any bonuses paid in early 2017 for 2016 performance, as well as equity grants made in early 2017. While the Committee used the December 2017 Survey data as a reference point, it was not the sole determining factor in executive compensation decisions in 2018. We generally seek to target total compensation opportunities at or around the survey group's median total compensation. Consistent with our compensation Guiding Principles, we incorporate flexibility into our compensation programs to respond to, and adjust for, changes in the business/economic environment and individual accomplishments, performance, and circumstances. December 2018 Survey. The December 2018 Survey is used throughout the CD&A when we discuss the competitiveness of the elements of the Named Executives' targeted compensation compared to our survey group. This survey was reviewed in December 2018, and includes 2018 compensation data of the survey group. The December 2018 Survey was prepared by the Company and reviewed by the Committee's consultant, and based on the Willis Towers Watson Executive Compensation Database. participates in the Willis Towers Watson survey process. The December 2018 Survey group used throughout the CD&A for comparison purposes is the same as group listed above, except that Arconic was excluded and Verizon was added. Arconic no longer met our criteria as a large company once it was spun-off from Alcoa. Verizon met most of the criteria to be included in the peer group. The survey database did not contain enough job-position-related matches for Mr. Ford, our Executive Chairman, and Mr. Hinrichs, President, Global Operations. Consequently, their compensation was excluded from our analysis of how the total direct compensation of our Named Executives compares to that of the survey group. The December 2018 Survey results indicated that the targeted total direct compensation for Mr. Hackett was at the survey group's median. Targeted total direct compensation was above the survey group's median for Mr. Farley, while at the median for Mr. Shanks. 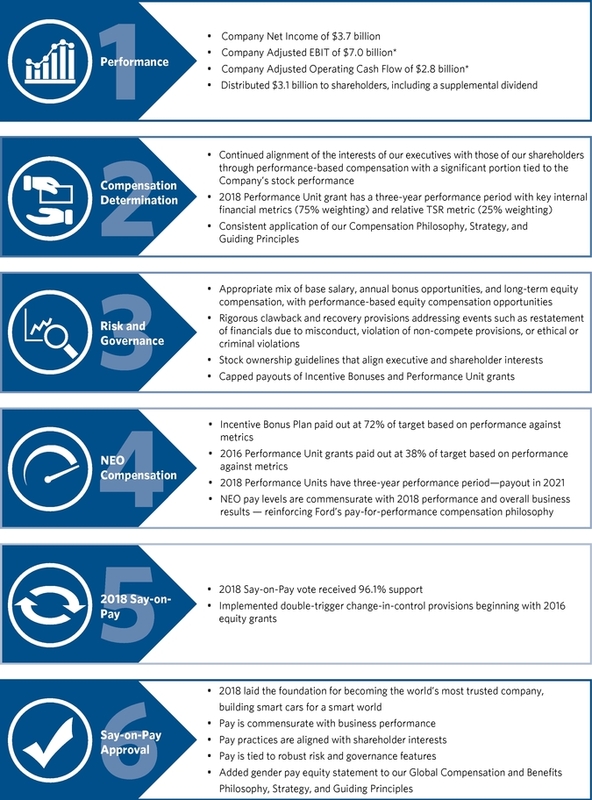 An analysis of how each element of compensation compared to the survey data for 2018, as well as how the factors described above affected Named Executive compensation decisions during 2018, is included in the discussion of each compensation element.